Although I had been to Detroit quite a number of times, it is an unusual experience to have such a charter bus fun along with old friends. Detroit is the heart of automobile production, but there are big draws for foreign tourists that is really wonder that Detroit is consistently buzzing with activities. Whole throughout my charter bus journey I felt this motor city is revving its engines again. Revitalized and reinvigorated after decades of neglect, Detroit is reclaiming its place as a cultural and tourist capital. Everything in this old Midwestern city seems new again. The Woodward Avenue theater district boasts renovated theaters and new shows. Downtown Detroit was such a lively area of shops, theaters, restaurants, and night life that residents of dreary, staid Toronto rode trains to Detroit for weekend excursions. In subsequent decades, the two cities switched places, but now Detroit is making a comeback. The old downtown of grand movie houses and department stores is all but vanished, but lively areas have sprung up around the perimeter of the aging banking-and-commerce center. The north end of downtown is the latest hot spot. Not surprisingly, the Motor City is impossible to navigate without a car. The metropolis has expanded into seven counties, with no end in sight, and the suburban population is more than three times that of the city proper. Although the landscape is mostly flat, recreational opportunities abound, most of them centered on water. To the northeast of the city sprawls Lake St. Clair, a shallow but large lake filled with boats and fish. The Detroit River is a resource that the city has never fully exploited, though a system of parks and greenways is now gradually taking shape. I learned that Detroit is not only about cars and bikes; there are lots more to Detroit than meets the eye. 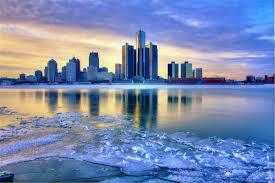 So, don’t think twice to rent a charter bus to Detroit for fun and entertainment. With the Busneeds you can customize your trip to cater to your group’s needs whether you need a Detroit School Bus or a Detroit Minibus rental. Busneeds.com helps to get you the right bus at the right price.